When you are dealing with data in an Array, you may be interested in filtering out all duplicate values. You may be interested in having a count of the unique values only. Whatever your reason, not having duplicate values in your array might be a good thing. 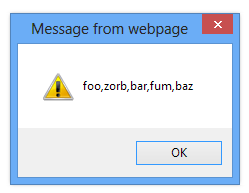 What you are about to see will only work if your array contains strings, numbers, or boolean values. Let's first look at the full code for making this all work. We'll dive into why the code works the way it does later. Now that you see this code working, let's actually learn why it works the way it does. Before looking at each line of this code in greater detail, let's first understand what we are trying to do. 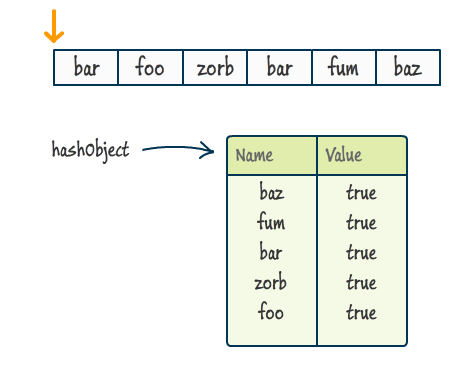 If you are not familiar with hashtables, I encourage you to read the following article. 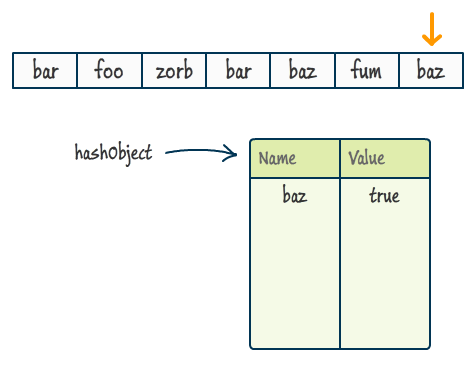 In a nutshell, a hashtable allows you to store values. 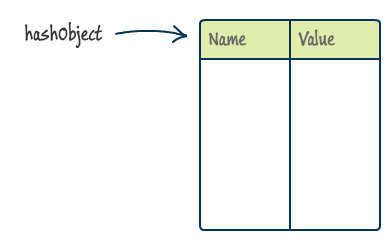 It stores the values by picking a precise location to store the value based on a name (aka key) you provide. Boring, right? The excitement happens when you try to retrieve a value. Instead of searching through each item in order to find what you are looking for, it uses the name you provided earlier to instantaneously find the value associated with it. 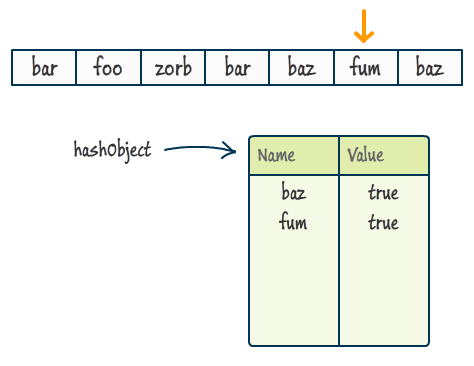 To put it bluntly, a hashtable is ridiculously fast when it comes to retrieving stored values. You'll see shortly how it is used to help us detect duplicate values. 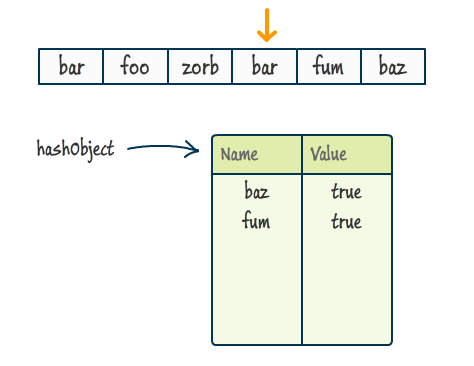 Does item exist in the hashObject? If item does not exist, add item to our hashObject with a random value such as true. If item does exist in the hashObject, the item is a duplicate. Remove the item from the array. Move to the previous item in the array, rinse, and repeat. If there are no more previous items, then pat yourself on the back and call it a day. What this means is that this instance of baz is a duplicate. When we hit a duplicate value, there is no point in keeping it around in our array. It's best to take it out back and put it out of its misery by simply removing it. At the end, what you are left with is just a unique list of items in your array. Seems pretty simple now, right? I won't cover prototypes in this article, but just know that it is this line that allows us to call the removeDuplicates function as a method on your array instance. Because this function is meant to be used via an array object, the keyword this refers to an array. To reduce confusion, I am simply referring to this via the input variable. Notice that our loop goes backwards. We start at the length of your array (normalized to a 0-based index position by subtracting a 1) and then decrementing until we hit 0. Now, you may be wondering why we are going backwards. The reason is that we will be modifying the size of our array by removing duplicate values. The only way to ensure your code doesn't crash in the middle of your loop is to end on a value that you are guaranteed to hit. That value is 0 aka the index position associated with the beginning of your loop. We create the currentItem variable to store the current item you are examining as part of our loop. 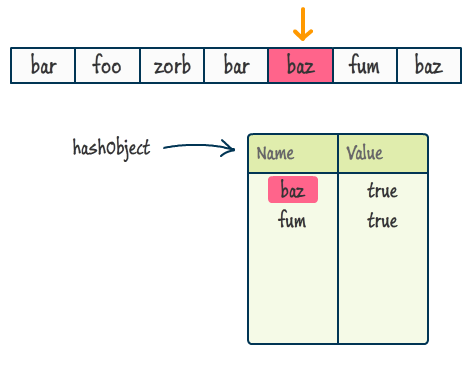 We first check if the currentItem exists in our hashObject. That is done by passing in the currentItem as the name and seeing if that returns a value of true. If a value of true is returned, that means it exists and the currentItem is a duplicate. This block of code essentially ensures that you keep your array free from duplicate values. If anybody asks, that is what you should tell them. There is nothing fancy going on here. Seriously. Absolutely nothing at all. Once this line is run, you are done. Ok, so here is the deal. The code I just showed you and explained works well. BUT, it could work better. As fellow Blenders, Jacob Alber and DoRon Motter pointed out, the main problem with the simple approach is that modifying the size of your array by removing an item each time a duplicate value is found is a very expensive operation. Each time you modify the size of your array, a new array is allocated in memory with the new size that you want. Your browser will eventually clean all that up, but there is the initial cost of having to deal with creating a new array that needs to be paid. For smaller sized arrays, that doesn't really make much of a difference. When you start going into having tens of thousands of items, then the few milliseconds you lose from the simple approach can easily add up. Just be aware of this potential issue when you are using this approach for removing duplicate values from really large arrays.